The Department offers comprehensive two-year master degree programme in Metallurgy and Materials Engineering. The curriculum is specifically designed to fulfil the requirements of industry as well as research and development. Following courses are offered in M.E. degree program. 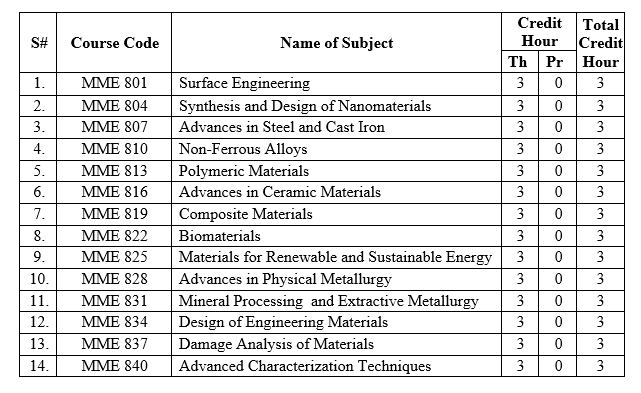 The Department also offers Ph.D. degree programme in Metallurgy and Materials Engineering. The degree comprises of courses and research work. Comprehensive exam is the pre-requisite to proceed Ph.D. research work. The student must pass both the written and oral components after the completion of minimum 18 credit hours. Course work includes 06 credits hours of compulsory courses and 12 credit hours of elective courses. Elective courses will be selected with consultation of research advisor/supervisor. 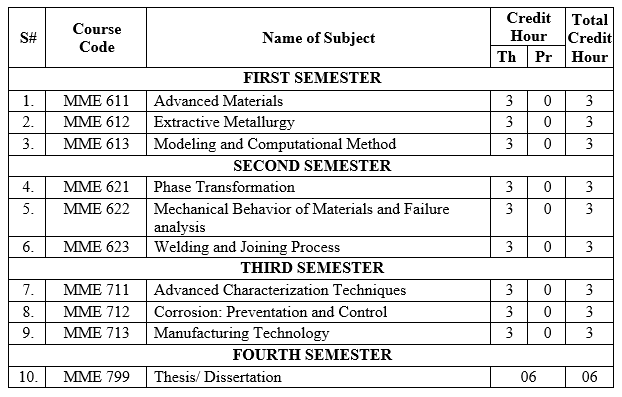 Following is the list of compulsory and elective courses.